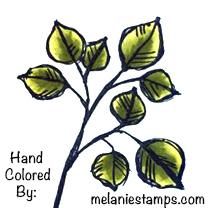 I am here today with the conclusion of my Stampin’ Blends ® Week. On Monday I shared with you a Blends Coloring Video, Wednesday we took a look at a quick and easy mid week card, and today we are fussy cutting out some beautiful florals. 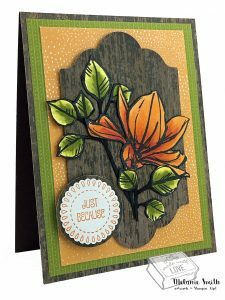 If these florals look familier it is because I posted them as close ups for promoting the Stampin’ Blends® back in the fall. This stamp set is named “Remarkable You”. 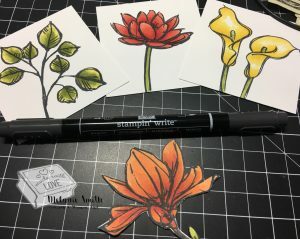 I would recommend this set for learning how to use the Stampin’ Blends® because of the large space within the flowers. Here you can see what the colored images were for my older post. I decided to fussy cut two of them for this project. As you can see by the Orange flower above that the edges show some “white space”. Because of this I use the Basic Black Stampin’ Write® marker around the edges. I like to do this with any fussy cutting. It just gives the images look more finished. Fussy cutting them this gives them a little more stability as well. For the leaves above you can see where I left quite a bit of “white” along the edge. I just covered it when I went around the edges with my Basic Black Stampin’ Right Marker. Here you can see them all finished. Don’t they look great? Here you can see the close up of the finished project. I positioned them with leaves behind and in front of the flower. The stems all merge nicely too so you can’t really tell that they have been glued together. 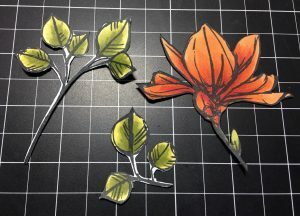 TIP: If you use our Tombow Liquid Adhesive if some glue shows around the delicate leaves you can use an adhesive eraser to fix it. It is the BEST $3-$5 you will ever spend. One last look…. This card took a little longer to complete but I think it was well worth it! Thank you for sticking with me all week long while I shared with you my love of Stampin’ Up!®’s new Blends Alcohol Markers. They are available now and will also be featured in the new 2018-2019 catalog which will release June 1st 2018. 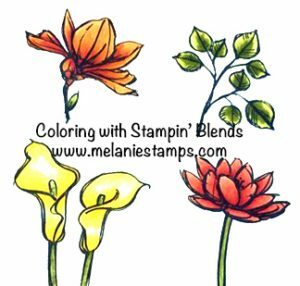 I am excited to bring you my very first Stampin’ Blends video tutorial. 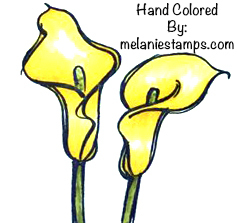 The coloring we will be doing today is for these yummy flowers shown on today’s card. All supplies will be at the bottom of this blog post. The sentiment along with this beautiful floral design that we color are both from the Petal Pallet Bundle shown below. I could create with this set everyday and never get board. It just gives so many possibilities. In my heart this IS a MUST HAVE bundle. 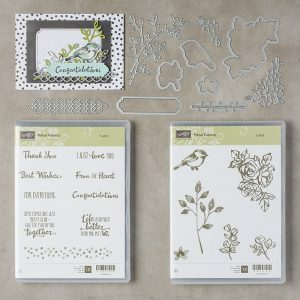 It includes 2 complete stamp sets including a really nice sentiment collection. Also don’t miss the add on dies as well. 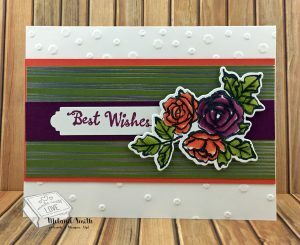 I used the sentiment window die and the “Best Wishes” sentiment from the bundle. I hope you have enjoyed today’s project and that you found the tutorial helpful. Leave me a message and let me know how you liked it. 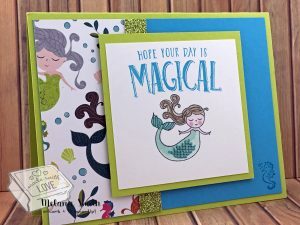 CAS Wednesday ~ Magical Mermaid! Want to get a card complete super quick? Then check in with me each Wednesday (Hump day) for a quick and easy card that can be made in moments. We all have those days we are busy in yet we so want to be creative too. Mid week here at Melanie Stamps is the place to be. Make sure to add your email address in along the side bar so you will get a mid week reminder when the new posts are published! 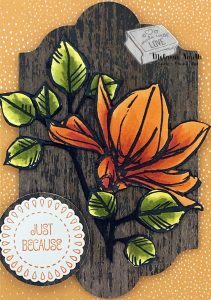 This card was designed and shared with me by Michelle T. who is also a Stampin’ Up!® demonstrator. I love how she used the designer series paper to really bring this card alive. The glimmer paper is also part of this suite along with the glitter washi tape which I shared with you on Monday. 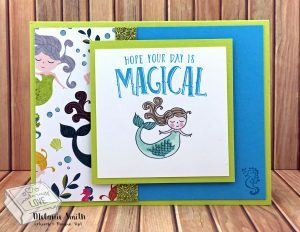 Check out the tiny sea horse she stamped in the bottom right corner… So sweet! She even added a little Wink of Stella to the mermaids tail after coloring with her markers. Thank you for sharing this card with all of us Michelle. 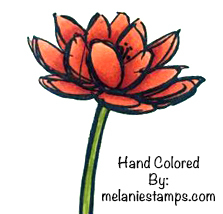 Today I am sharing some coloring I did with the NEW Stampin’ Blends this evening. I have had this “Remarkable You” stamp set for quite some time and I immediately thought of it when trying to decide which set to color first. These 4 large images are perfect for Alcohol Marker Shading. Below are the color combos I have used for each individual flower. I hope this encourages you to gives these markers a try. I am more than happy to help guide you in any way needed. For these I simply used Light and Dark Daffodil Delight along with Light and Dark Old Olive. Last but not least I colored this beautiful flower with Light and Dark Calypso Coral and Light and Dark Cherry Cobbler along with light and dark Old Olive for the stem. 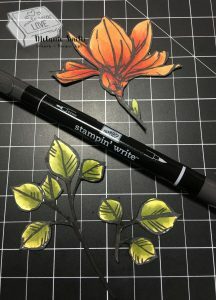 Stampin’ UP!® Blends Markers are HERE! 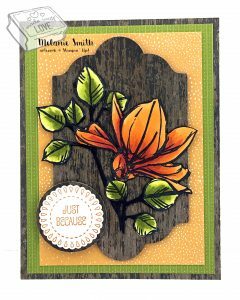 This is my very first post to my Exclusive Stampin’ UP!® blog. I have been slowly working on this blog design for a while. A lot of you may have seen my posts over at www.fairystampland.com and may be wondering why I am starting another blog? I want to separate my design team work with non Stampin’ Up!® companies from my Stampin Up!® work. I love both but I think it gets a little confusing for the reader. 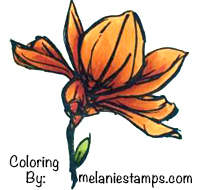 So www.melaniestamps.com will be 100% Stampin’ Up!® projects, promotions, and stamping fun. A lot of you may be joining me from my other blog where I have mostly shared my work using Copic Marker Coloring. 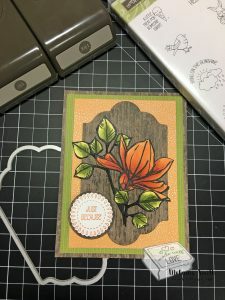 So it excites me to no end to begin this blog introducing you to the NEW Stampin’ Blends Alcohol Markers. I will be sharing photo samples of my coloring soon so stay tuned. Thank you for stopping by today.